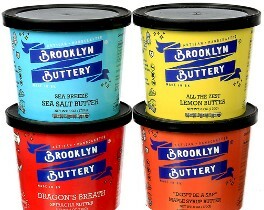 Brooklyn Buttery handcrafts artisanal butters. The company was started by Josh Green in 2016 with the mission of bringing compound butters out of the kitchens of high-end restaurants and into the pantries of all, using the best ingredients found in the New York City area. The butter comes in four varieties in 6-ounce plastic tubs. They are: All the Zest Lemon Butter, Don’t Be a Sap Maple Butter, Dragon’s Breath Sriracha Butter and Sea Breeze Sea Salt Butter. Brooklyn Buttery is one of seven companies to participate in the Dairy Farmers of America’s (DFA) 2019 Accelerator program. As a participant, Brooklyn Buttery will engage in a 90-day immersive program, which is part of the Sprint Accelerator program. The company will work directly with leaders from DFA, CoBank, Sprint and other industry experts and mentors to create strategic, long-term partnerships. 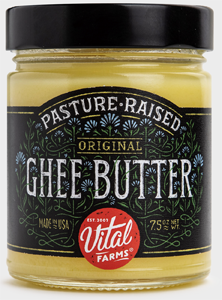 Vital Farms introduces Ghee Butter. The butter is made from milk that is ethically sourced. The cows come from small herd family farms and are raised in the same state that the butter is produced. They each get a half acre of open pasture for roaming and foraging. Vital Farms butter is slow churned in small batches. Lactose and casein free, this clean and versatile butter oil is designed for every culinary need. It is made by cooking down butter to remove the water and milk solids, a process called clarifying. Made from butter that is 85% butterfat--a higher than industry norm butterfat content—Vital Farms Ghee Butter comes in 7.5-ounce jars in Original and Himalayan Pink Salt flavors. The suggested retail price is $8.99. To read more about this product, link HERE to the February 15, 2019, blog titled "Dairies Are Going Non-Dairy: It’s Time to Get on Board"
Wegmans introduces imported premium butter. The company enlisted well-known cheesemaker Rodophe le Meunier to make Beurre de Baratte de Normande. This butter is made from French grass-fed cows milk, cultured, hand churned and sprinkled with French sea salt. The random-weight packages are priced $17.99 per pound. Westby Cooperative Creamery grows its organic line with butter. The one-pound box of four sticks joins the Westby Organic brand’s 4% and 2% small curd cottage cheese, regular cultured sour cream and cultured French onion dip, which were all introduced in 2017. The sweet cream butter is lightly salted with Celtic Sea salt and contains 85% butterfat. The foodservice/food ingredient bulk sizes are 40- and 55-pound boxes. Westby Cooperative Creamery is now in its 115th year of operations, selling both conventional and organic products. 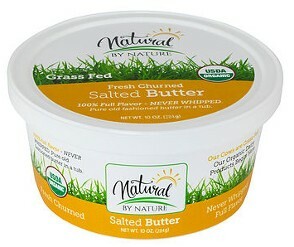 Natural By Nature introduces Organic Grass-Fed Butter, fresh churned and never whipped. The company’s new organic grass-fed butter—salted and unsalted--is the best of both worlds: the full rich flavor of stick butter coupled with the ease and convenience of being in a tub (10 ounces), without being whipped. Whipped butter is injected with nitrogen (after churning) and therefore has less flavor than non-whipped butter, according to the company. The product debuted with the brand’s new look, which includes a logo and package design to not only honor the animals that produce the milk going into the brand’s products but also to honor the land that supports and nurtures the animals. The logo pays homage to the key ingredients in the products. Packaging calls out other aspects of the product. Sunshine, grass and water. These are the key ingredients that make our dairy products special. Yes, technology is advancing our food system forward. But at Natural By Nature our greatest innovation relies on simplicity, the simplicity of understanding the natural processes and habitat of our animals, and honoring the land that nurtures and cares for them. We believe that the best-tasting dairy products happen when nature is allowed to follow her natural rhythms. Then, what emerges are dairy products that reflect the natural instincts of our animals and the natural cycles of our land. We are indeed Natural By Nature. Land O’Lakes introduces Land O Lakes Soft Squeeze Spread. Based on canola oil, buttermilk, butter and cream, the new refrigerated topping delivers the taste of Land O Lakes Butter in a convenient, easy-to-squeeze 12-ounce bottle with less mess. Each bottle contains about 24 tablespoons, with one tablespoon containing 90 calories and 9 grams of fat. 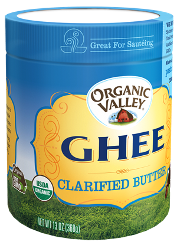 Organic Valley is putting Ghee in the spotlight with a new marketing campaign for the almost decade-old product line. Ghee is clarified butter, which is basically slow simmered butter in which excess water is removed. This allows some of the milk solids to caramelize, leaving behind hints of sweetness and roasted nuts. Ghee is a lactose-free, casein-free and shelf-stable product. It has been a staple of many culinary traditions around the world for centuries, and today it’s prized for its rich buttery taste, enticing aroma and its high smoke point, which makes it ideal for high-heat cooking. Organic Valley’s product comes in 7.5- and 13-ounce containers. The product does not require refrigeration, rather it may be stored in a cool, dry, dark place for optimal flavor. It should be capped when not in use. A 1-teaspoon serving contains 45 calories and 5 grams of fat. 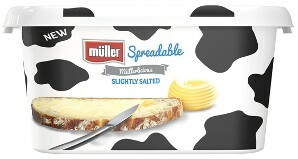 Müller introduces Müller Spreadable to the U.K. market. Müller Spreadable is made with 73% real churned butter, giving it a deliciously creamy taste. The dairy company believes it can drive consumption across all age ranges, but particularly families. New Müller Spreadable comes in four offerings. There’s slightly salted and unsalted in 250-gram and 400-gram tubs. There’s also new salted and unsalted Müller Butter in 250-gram blocks. “The Müller brand exists to bring everyday moments of pleasure, and with this launch, we’re bringing the delicious creamy Müller taste to the category for the first time,” says Dan Howell, commercial director at Müller Milk & Ingredients. 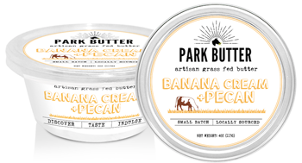 Park Butter hand crafts all-natural butters for retail and foodservice. 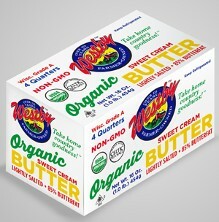 It is a family-owned and operated producer of artisan grass-fed butters located in Miami. The company uses fresh and locally sourced ingredients whenever possible. The butters are made in small batches and highlight herbs, fruits and spices at the peak of flavor. Plain comes salted and unsalted. The six flavors are: Balsamic & Red Onion, Banana Cream & Pecan, Chipotle, Chocolate & Cardamom, Roasted Garlic & Herb, and Rosemary & Honey. The butters come in 4-ounce 100% plant-based compostable containers. 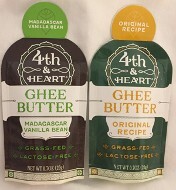 4th & Heart introduces shelf-stable, single-serve packs of ghee, including flavors! The company makes its ghee from grass-fed milk. The clarified butter is said to cook like oil and spread like butter. It comes in Original recipe, along with three flavors. They are: California Garlic, Himalayan Pink Salt and Madagascar Vanilla Bean. The original line is sold in 9- and 16-ounce jars. The new portable product comes in 0.7-ounce single-serve packs. 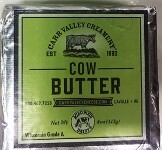 Carr Valley Cheese introduces artisan butter line. Since 1883 this Wisconsin creamery has been handcrafting cheeses from cow’s, goat’s and sheep’s milk. Now it’s making butter. The company is introducing a line of butter made from cow’s, goat’s or sheep’s milk, or all three. The latter is sold under the Menage name. The butters come in 4-ounce foil squares, as well as 8-ounce clear plastic tubs. 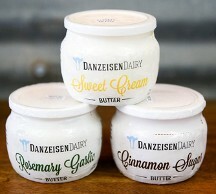 Danzeisen Dairy takes its hand-crafted butters to retail. Until recently, the Arizona dairy only sold its butters at its company store. Now the butters are available in high-end supermarkets in the Tucson and Phoenix areas. They come in 8-ounce glass jars in three varieties. They are: Cinnamon Sugar, Rosemary Garlic and Sweet Cream. The suggested retail price is $5.99.